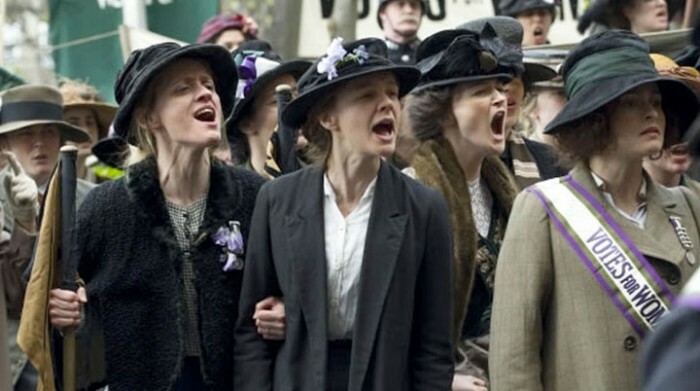 Suffragette is a new film coming from Film 4, Written by Abi Morgan (Shame) and directed by Sarah Gavron (Brick Lane), it stars Carey Mulligan alongside Helena Bonham-Carter, Brendan Gleeson, Anne Marie Duff, Ben Whishaw, Meryl Streep. Mulligan plays a women’s rights activist in the early days of the feminist movement. SUFFRAGETTE is a thrilling drama that tracks the story of the foot soldiers of the early feminist movement, women who were forced underground to pursue a dangerous game of cat and mouse with an increasingly brutal State. These women were not primarily from the genteel educated classes, they were working women who had seen peaceful protest achieve nothing. Radicalized and turning to violence as the only route to change, they were willing to lose everything in their fight for equality – their jobs, their homes, their children and their lives. MAUD was one such foot soldier. The story of her fight for dignity is as gripping and visceral as any thriller, it is also heart-breaking and inspirational. The release of the trailer is also in support of the #VotingMatters campaign, urging women to register and have their say on polling day (7 May). In 2010, more than 9 million women failed to vote. Suffragette opens on 30 October 2015.